I am a photographer and a traveler. I am also a cook with a true love of food. Last fall, my husband and I loaded up our 5th Wheel and took off for some alone time in New Mexico. One evening while in Taos, I had a brownie that was very unique tasting. I narrowed the ingredients down to cinnamon and chile powder. I searched for a brownie recipe that would accommodate both of those ingredients. I made this recipe several times, but decided to use a few extra and different ingredients and I think I found it! 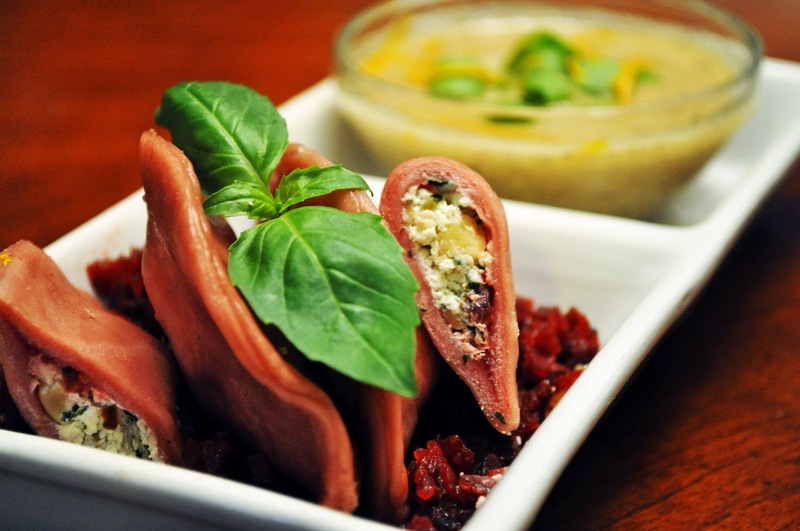 We have a wonderful specialty spice shop in Oklahoma City called Savory Spice Shop. I purchased a few different ingredients and it’s exactly what the recipe needed. After baking a few batches, I got it right. I hope you enjoy this “twist” on a staple brownie. Preheat oven to 350°F. Grease a 13” x 9” glass pan. Place butter, cocoa powder and sugar in a medium sauce pan. 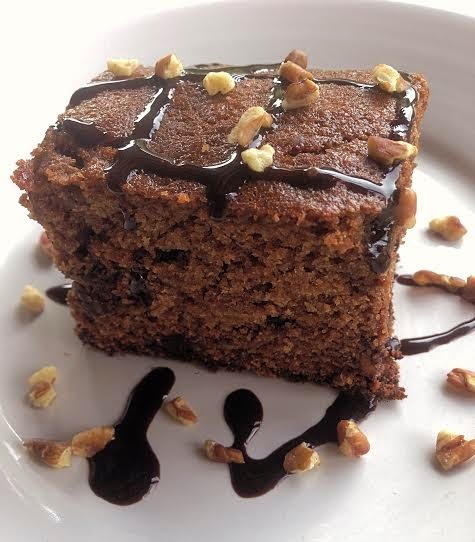 Cook over medium heat and stir continuously until butter is melted and cocoa and sugar are well-blended. Remove from heat and let cool for approximately 5 minutes. In a large mixing bowl, mix together the flour, baking powder, chile powder, cinnamon and salt. Mix well. Add the chocolate mixture to the dry ingredients and mix well. Incorporate the chocolate chips into the mixture. Pour into the 13” x 9” baking pan and spread evenly. Bake for 35 minutes. Remove from oven and cool for 30 minutes. 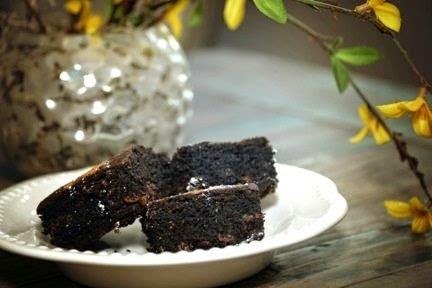 Cut into squares and sprinkle powdered sugar and cinnamon on tops of brownies. *I learned that chile powder is pure, ground chiles. Chili powder has other spices mixed in. Make sure you use the chile powder for this recipe. Mix dough ingredients together. Knead a few times until the dough is smooth, then place in a lightly oiled bowl. Cover and let rise for one hour, then transfer to fridge and allow the dough to relax for 24 hours. Preheat oven to 450°F with a baking stone or pizza stone on the middle rack. Roll dough out to a thickness of 1/16". Transfer to a piece of parchment paper. Brush dough lightly with olive oil, then layer on toppings, in order of listing. Bake for 18-20 minutes. Serve immediately. Oh, what fun it is to bake with good flour! I've been wanting to try my hand at doughnuts for a good long while now, and a challenge from Bob's Red Mill created the perfect opportunity. On a cool-ish afternoon, I fried my very first doughnuts. I produced excellent cinnamon twists with a tender crumb, and found them excellent, as long as they were eaten the same day. Just like bakery doughnuts, the day-old ones just aren't as good. A few days later, influenced by Joy Wilson at www.joythebaker.com, I made a batch of baked doughnuts. I worried at first that they'd be a pale imitation of "real" doughnuts, but I found that they have a rich flavor and are much, much simpler (and quicker.) Family and friends who tried both types agree that the baked version is excellent - so long as they are glazed, which hides the pale puffy tops of a baked version. I've decided that for me, frying doughnuts is just too much fuss and bother, and figuring out what to do with the 2 quarts of used oil presents another problem as well. We're looking forward to more baked doughnuts, and I'm sure to try pumpkin doughnuts this fall. Pour 1/2 cup of very warm or hot water into the bowl of your mixer fitted with the paddle attachment. Dissolve the 1 1/2 teaspoons sugar in the hot water, pop in your thermometer and let it cool to about 105˚F while you gather wet and dry ingredients. Combine dry ingredients in a large bowl: 1/4 cup sugar, baking powder, mace, cinnamon, salt, and flour. Whisk it all together to aerate it well. If you prefer, sift it together. When the temperature of your hot water and sugar mixture is close to 105˚F, spoon the yeast into the mixer bowl and stir it a bit to combine. Let it stand and proof for 5 minutes. After 5 minutes, the yeast should be bubbling. Add in the cubed butter, egg, and vanilla extract, and mix on low speed until the butter breaks up. This should take about a minute. Then add the dry ingredients, a cup at a time. After about half of the dry ingredients, if your paddle is getting clogged, switch to the dough hook and add the rest of the dry ingredients, a bit at a time. Continue working the dough with the dough hook for about 2 minutes until the dough comes together and picks up all of the little crumbs at the bottom. At this point, you can let the dough rest, up to 2 hours. Don't let it rest too long or else the dough will develop a yeasty, beery taste. If you are ready to proceed, shape the dough. Roll the dough to 1/2" thick and cut the dough into 6 strips. Roll each strip into a long snake, then twist the two ends in opposite directions. Hold up the ends, press them together, and let the strip form into a natural twist. Lay each twist flat on a floured cookie sheet at least 2" apart. Construct a proofing chamber in your oven by placing a 9”x 13” roasting pan on the bottom rack. Pour boiling water into it to fill it to about half way. Put the pan of doughnuts on the top rack, uncovered, and let them rise for 45 minutes. While the dough rises, heat the oil. You will want to use a big pot that it at least 5 inches deep (I used a 6-quart Dutch oven.) Fill it 2” deep with canola oil, and set over medium heat. Put a suitable thermometer in the pan of oil, and let the oil heat to 350˚F. This will actually be ready just about the time that the dough is finished with its rise. Let the doughnuts drain on a rack set over absorbent paper. When all the doughnuts have been fried, toss them in sugar or cinnamon-sugar. Place a rack in the upper third of the oven and preheat oven to 350˚F. Lightly grease a 6-well doughnut pan. In a medium bowl, whisk together flour, baking powder, baking soda, salt, mace and sugar. Set aside. In a small saucepan over medium-low heat, melt the butter, which will crackle and bubble as it melts. This is the water boiling out: Once it has evaporated, the butter will be still, and will begin to brown and smell nutty. Watch it carefully - it can burn very easily. Remove from heat and immediately transfer browned butter (brown bits and all) to a small bowl. In a small bowl whisk together egg, buttermilk, and vanilla extract. Measure out 2 Tablespoons of browned butter and whisk into the wet ingredients. Add the wet ingredients all at once to the dry ingredients. Stir together until the ingredients are well-combined and no streaks of raw flour show. Try not to overmix the batter, that can make the doughnuts tough. Portion the batter into the prepared pan with a small spoon. Fill each doughnut in the pan three-quarters full, and smooth out the batter. Place in the oven and bake for 10-12 minutes. Remove from the oven and allow to cool in the pan before inverting onto a wire rack to cool completely. Make the glaze while the doughnuts cool. For the glaze: Sift the powdered sugar, cocoa powder, and salt into a medium bowl. Add 2 Tablespoons of milk and vanilla extract; whisk well to combine. Add more milk as necessary to create a thick, but still just pourable glaze. 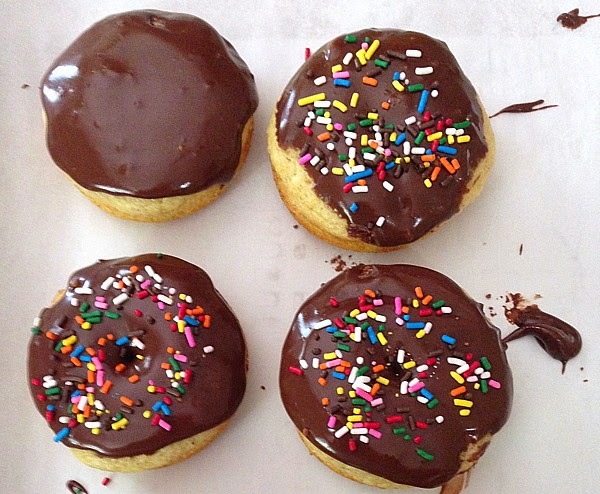 Once the doughnuts are completely cool, dip top-side-down into the chocolate glaze, or spoon the glaze over them. Return to the wire rack and (optional) sprinkle with toppings. Allow to set for about 30 minutes before stacking or serving. Doughnuts are best eaten the day they are made. A friend of mine ran across this recipe when she was looking for ways to use some whole wheat flour that she had in her pantry. I also had some Bob's Red Mill whole wheat flour in my kitchen, and I had a lunch date planned with my friend for the coming weekend. As she was super busy at work, I decided to try her recipe and present her with a plate of these treats. The original recipe relied solely on chocolate chips for flavor, but I decided to add a bit of Nutella for a different twist. The resulting squares were very much like brownies, but more dense in texture. They were very easy to put together, but they took quite awhile to completely bake through. In the end you could definitely taste the whole wheat flour, and they were not overly sweet. Kiddos might not be too crazy about them, but the adults that tried them appreciated the fact that they were almost like a chocolate bread. They were perfect to share with a good friend while enjoying a cup of coffee and good conversation. In the bowl of a stand mixer, combine the brown sugar, white sugar, applesauce, butter, large egg, egg yolk, and vanilla. Mix on low speed for approximately 2 to 3 minutes until mixed well. In a separate bowl combine the whole wheat flour, the salt, and the baking soda. Add the dry ingredients to the wet ingredients in the stand mixer bowl. Mix all ingredients together at a medium speed until well incorporated. Remove the bowl from the stand mixer, and add the chopped pecans, Nutella, and chocolate chips. Mix gently by hand. Spray an 8"x 8" baking dish with nonstick spray and pour the batter in. Preheat your oven to 350°F, and cover the baking dish with aluminum foil. When oven is heated, place baking pan inside for one hour. After an hour, check the bars, but do not be surprised if they are not yet done. Re-cover and place in the oven again. I allowed mine to cook, covered, for another half hour (1 1/2 hours total, covered.) After this time, I removed the cover and checked them again every 20 minutes. Overall, my bars took about 2 hours and 10 minutes to cook completely. They will puff up, crisp on top and smell wonderful when they are ready. Remove from oven and allow to cool before cutting. 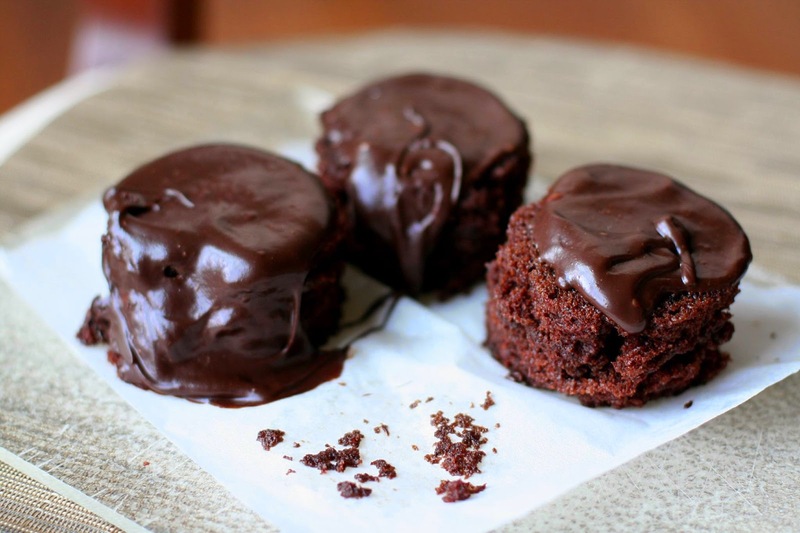 If desired, drizzle the individual squares with warmed chocolate or Nutella before serving. Makes 9 squares. I love my neighbor Mary. Seven years ago I was in my new kitchen getting unpacked, the house full of three moving men, three children, three pets and Willie. The door bell rang and I didn't even try to answer it. I knew someone else would, so I kept to my futile attempts at organizing chaos. A few minutes later I turned to my right and there appeared a bag of cookies marked Organic Chocolate Chip Cookies and a lovely note welcoming our family to the neighborhood. I thought, "how lovely, how special, how amazing that my new neighbor would go to the time and expense of making us an organic treat!" As I would come to know over the years, that's just Mary. Lovely, special, and amazing! I've been trying to find something that Mary would find special and I think these fit the bill. Whether you are a Ding Dong fan (like me) or not, whether you are a vegan (like Mary) or not, you will find these delicious. Make them for yourself, make them for your friends, make them for a new neighbor, but definitely make them! Preheat the oven to 350°F. Prepare the cupcake pan(s) with liners. * Yield: 12-14 cupcakes. Mix all dry ingredients together in one bowl and wet ingredients in another. Add wet ingredients to dry and stir until just combined. Fill each cupcake liner about 2/3 full. Bake for 15-18 minutes until a toothpick comes out clean. Cool completely. In a clean bowl, beat the shortening until there are no lumps. Scrape down the sides and then add the sugar and vanilla and mix at increasing speeds until combined. Reduce speed to low and add almond milk 1 Tablespoon at a time, until the mixture is light and sort of marshmallow-y. Prepare a piping bag with a long narrow tip, like a Bismarck tip, and fill it with the "cream". Insert the tip into the center of each cupcake and press in the cream. The cakes are light and airy so there is no need to scoop out any of the cake. Place the chocolate chips and the coconut milk in a Pyrex bowl and stir. Put in the microwave for 10 seconds at a time until all chocolate is melted and smooth. Quickly whisk in the canola oil. 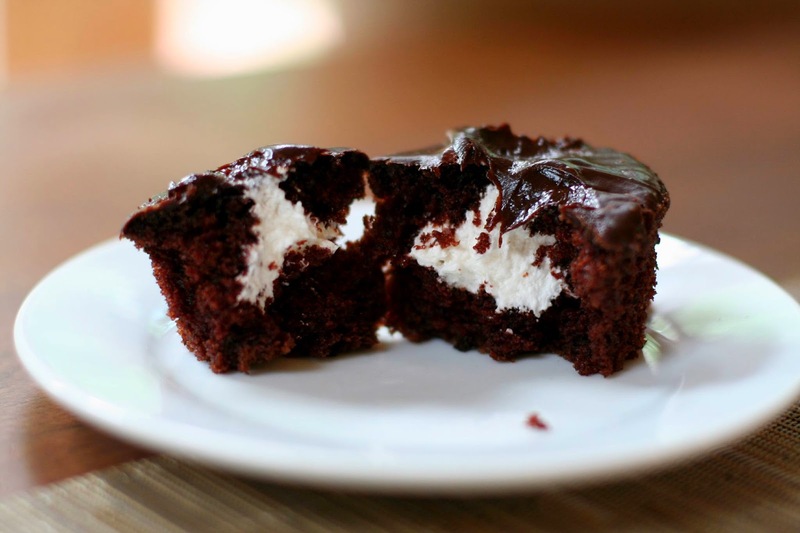 Dip your "cream" filled cupcakes upside down into the chocolate ganache and then let set. 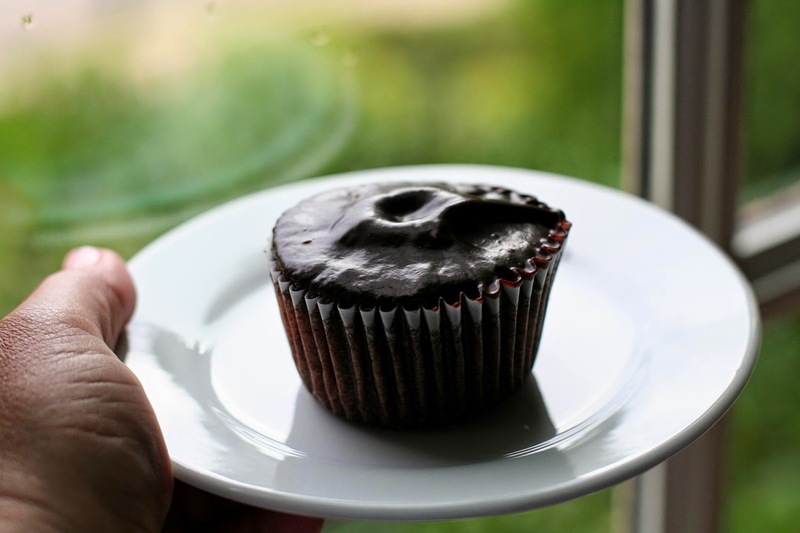 These cupcakes can be made the day before serving and refrigerated or frozen if you need to make them further ahead of time. Let them come to room temperature before serving for the "cream" filling to be at it's best consistency. They will taste just as delicious as the day you made them. the chocolate cake batter between the two pans and bake for 16-20 minutes. Cool for 10 minutes, remove cake from pans and cool completely. Cut cake with biscuit cutters. Place one cake on top of another cake so that all of your Ding Dongs are two cake high. Yield: 8 Ding Dongs. Mine were not pretty, as you can see from this photo. But they were delicious! And they were eaten within an hour! These dumplings are a perfect first course or served on a tray at a party. They are good warm, but are also delicious served at room temperature. The sauce also doubles as a great salad dressing. In a food processor, combine the first 6 ingredients and pulse until smooth. Season with salt and pepper. Just before serving, top with the chopped green onion and orange zest. In a small bowl, mix together the goat cheese and basil. Add the walnuts and combine. Set aside. In a food processor , pulse beets with the olive oil until they are finely chopped. Set aside. In a stand up mixer, combine flour and beet juice until dough is smooth. Let rest for 10 minutes. Divide dough into 16 equal portions. Roll each portion into a ball. Roll, out each dough ball into a 2 1/2 to 3-inch circle. 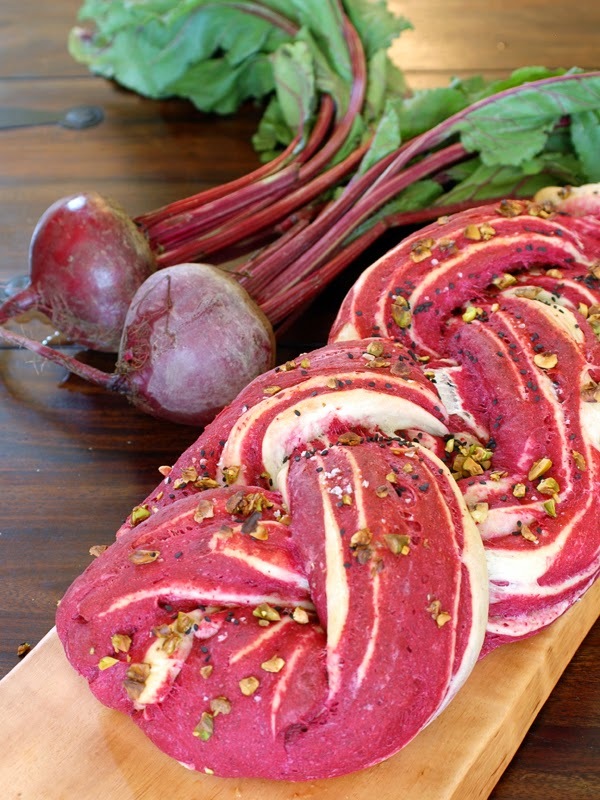 Fill each center with 1 teaspoon of the goat cheese mixture and 1 teaspoon of the roasted beets. Fold each dumpling in half and pinch closed. When all of the dumplings are assembled, bring a large pot of water to a boil. Boil the dumplings in batches, about 3 minutes each or until they float. Remove with a slotted spoon and finish the remaining dumplings. Serve with the walnut dipping sauce. 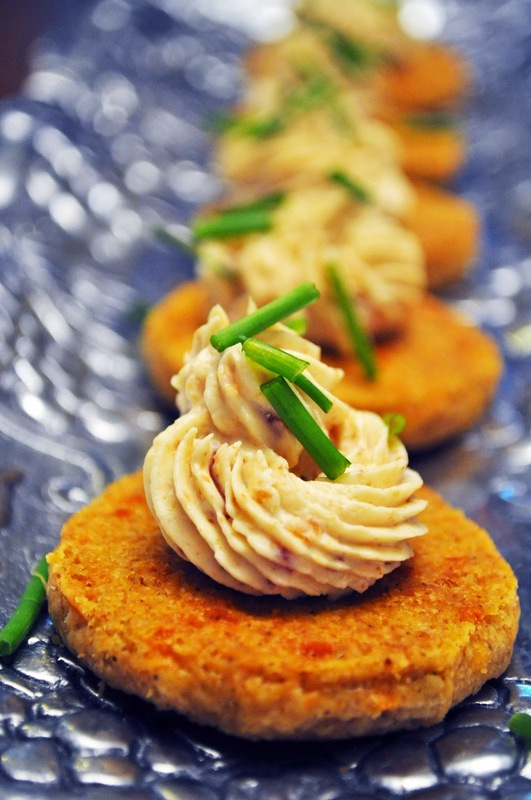 These tasty hors d’oeuvres are the perfect addition to any party. Whether it be upscale or a small gathering with friends, they won’t last long! I like to serve them with apple slices, they are a nice accompaniment to the richness of the cheese. These savory shortbread are good all by themselves. They are simple to make, but do take some time chilling. I recommend making them at least one day in advance so that all you need to do is slice and pop them in the oven when you need them. In a large bowl, sift together flours, salt, pepper, cumin, Ancho chili powder, Mexican oregano, mustard and garlic powder. Set aside. In the bowl of a stand mixer, cream together the cheddar cheese and butter. Slowly add the dry ingredients and beat until blended. Form dough into a ball, cover and chill for at least 2 hours. Remove the chilled dough from the bowl and shape into 4 logs (approximately 8 inches each). Chill for at least 8 hours or overnight. Preheat oven to 350°F. Slice logs into wafers about 1/4-inch thick. Place onto an ungreased baking sheet. Bake wafers in batches for about 15 minutes each. Remove from oven and allow to cool for a minute or two and then transfer to wire racks to cool completely. To make the topping, pulse cream cheese, bacon and honey in a food processor until smooth. Place the mixture into a piping bag with a large star tip and pipe stars on each wafer. Sprinkle on the chipped chives. Alternatively, you can spoon a heaping teaspoonful of the cream cheese mixture onto the wafers. Serve. 1. 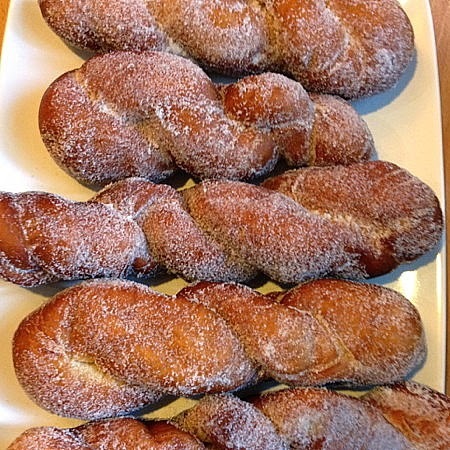 Dough logs can be frozen, then sliced and baked. Just add a few minutes to the baking time. 2. You may use all Bob’s Red Mill Organic Unbleached White Flour instead of half white and half wheat. If you do, eliminate one stick of butter. I remember loving animal crackers when I was a kid, and the box with the string was an added bonus. I could carry it around like a little purse. 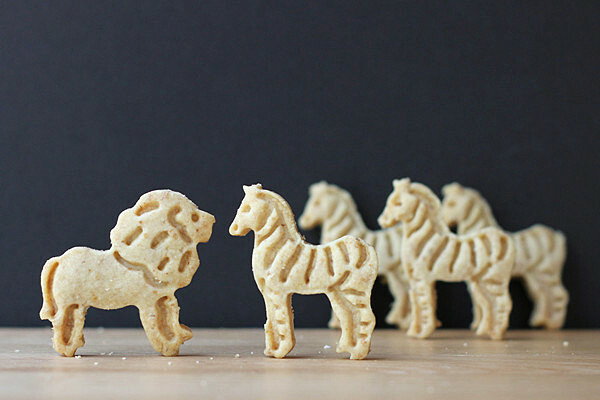 Maybe it was my fascination with animal crackers that fueled my adult love for cookie cutters, and my giddy joy at finding these adorable animal-shaped cutters. These critters aren't exactly the same as the ones sold as animal crackers, but I think they might even be better looking. And they were perfect for a challenge featuring flours from Bob's Red Mill. The recipe here is perfect for cookie cutter creations, since the cookies don't rise or spread much at all, so you don't lose the shape or the embossed design. In a medium bowl, cream the butter, sugar and salt. Add the vanilla extract and continue beating until combined. Add the flours and mix until combined. Gather the dough into a ball, flatten to a disk, and refrigerate until chilled – or for several days, if desired. Preheat the oven to 350°F, lightly flour your work surface, and have baking sheets standing by. Working with portions of the dough at a time, roll the dough to about 1/4 inch and cut with cookie cutters as desired. Right out of the refrigerator, this dough tends to be a little brittle and tends to crack apart, but as it warms slightly, it's easier to roll. If it does break apart, you can just gather up the pieces and mash them together. Place the cookies on a cookie sheet. Parchment paper is fine, but you don't need a greased cookie sheet. You can re-roll the dough scraps and cut more cookies, but if the dough gets too soft, it can be hard to work with as it sticks to your work surface and flops about when you try to pick up a cookie. If that's the case, just refrigerate it for 10 minutes or so, to let it firm up, then continue rolling and cutting. Bake the cookies at 350°F until lightly browned on the edges, about 14 minutes. 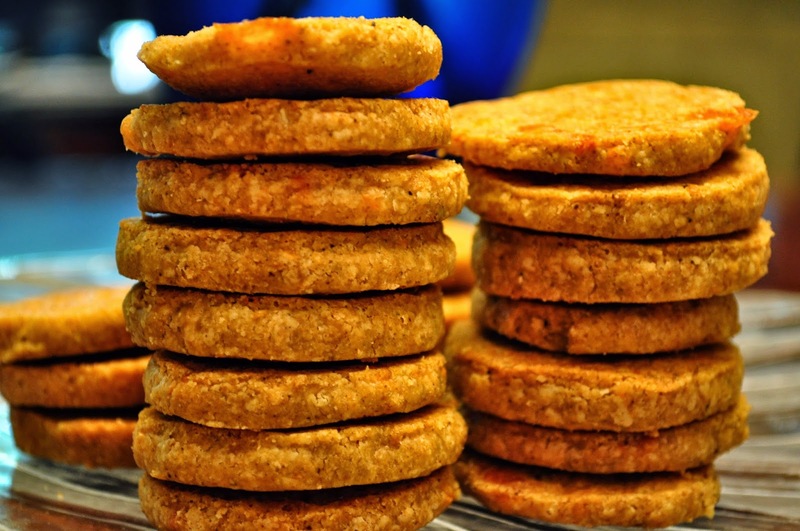 Let the cookies cool on the pan for a while before you transfer them to racks to cool completely. They're a little fragile when warm, but they'll firm up as they cool. These are still slightly delicate when completely cool, so don't plan on putting them in a box and shipping them across the country. Warning: Don't store your predator cookies with the prey cookies. Pie may be more celebrated, but bars are handheld! 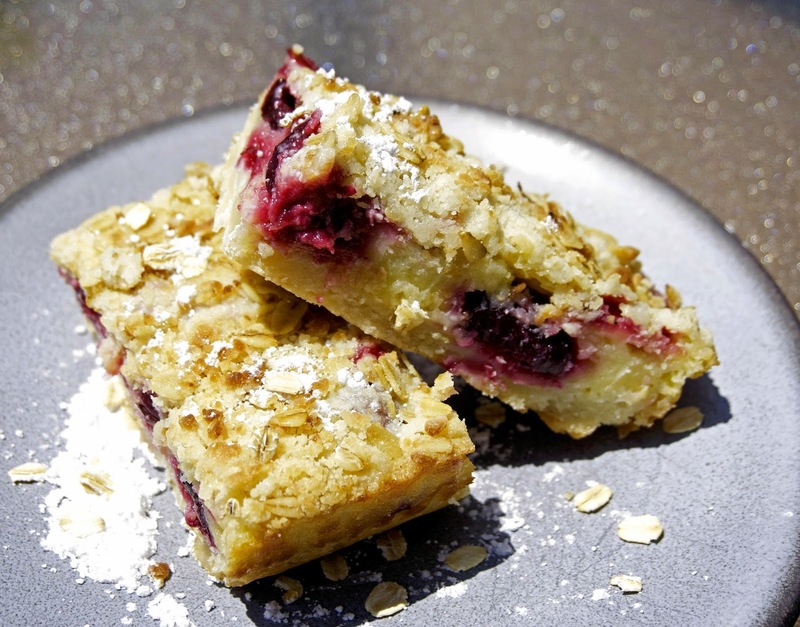 Try these Cherry Pie Bars at your next potluck and watch them disappear. 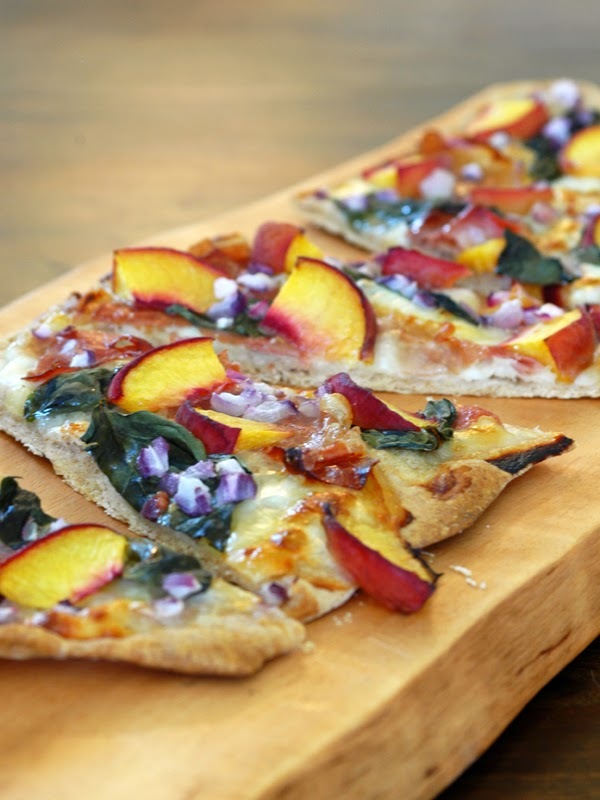 In a bar recipe like this, however, the thicker crust plays a big part in the overall flavor, so make sure to use high quality flour. I've long preferred certified-organic Bob's Red Mill. Preheat the oven to 350°F with its rack in the top third. Grease a 9-by-9-inch baking pan and line it with parchment paper (one strip each direction of the pan, overlapping). Then grease the parchment paper. Start with the crust. Combine the butter, powdered sugar, flour, salt and zest in a medium to large bowl. Use a pastry cutter, a big fork or your fingers to work the ingredients into a shaggy dough. Don't worry if it's not super smooth or incorporated. Take 1/2 cup of the dough, put it in a separate smaller bowl and add the oats, stirring to combine and create a crumble. Set that bowl aside for later. Back to the rest of the dough, stir again until it's relatively smooth and soft, and can form a ball. Then break that ball into smaller chunks, which you'll press into the bottom of your greased pan. Use extra flour if it's sticky, and press until it's even. Bake for about 15 minutes, or until the dough is browned around its edges. Meanwhile, start the filling. Whisk the eggs, sugar, flour, lemon juice, sour cream and salt together until incorporated in a medium bowl (even the same bowl, if you'd like). Place the cherries on the baked crust. If using frozen cherries, make sure they're well-drained before adding. Pour the filling over the cherries, then sprinkle with the reserved oat crumble. Bake the bars for about 30 minutes or until set. A little jiggle in the center is OK, but the bars should be relatively set. Cool the pan to room temperature and then chill for at least 60 minutes before slicing. Serve chilled or at room temp -- and add ice cream for an a la mode version, if you're feeling fancy. The bars keep well in the fridge for up to four days. Lesson No. 1 of making pizza at home: It's not hard to make pizza dough. Lesson No. 2 of making pizza at home: The hard part is finding your perfect dough recipe. And after years of experimenting with different ratios and methods — including pizza dough in the bread machine, which I now think silly — I have found my dough with Smitten Kitchen's Lazy Pizza Dough! It's excellent if making traditional-crust pizza, meaning made with white flour, but it holds up well when you mix in some wheat flour for heft and health. Note: With these measurements, DO NOT PACK YOUR FLOUR. These are "fluff and level" cups, which should weigh about 125 grams if you have a kitchen scale. The "lazy" part of the recipe comes from its flexibility. There are three yeast options depending on when you plan to eat your pizza. For the overnight option, start the dough after dinner to serve the next night for dinner (about 22 hours.) For the all-day option, start in the morning before the planned pizza dinner (about 12 hours.) For the part-day option, start your dough at noon for dinner that night (about 6 hours.) Whichever way works for you, the recipe yields enough for two thinner-crust pizzas, perfect for two 9-by-11-inch cookie sheets. Oh, but I almost forgot. Lesson No. 3 of making pizza at home: Use a quality flour. You pay attention to the quality of your sauce, cheese and other toppings; pay as much attention to your flour's quality by using a top-notch product like Bob's Red Mill. Adapted from Smitten Kitchen and Jim Lahey's "My Pizza"
Mix all the ingredients together in a large bowl using a spoon. The dough will be very rough and craggy usually, but add a spoonful of water if it seems too much so. Cover your still-craggy dough with plastic wrap and keep at room temp for the 22/12/6 hours of your dough schedule. See above. Scrape the dough out onto a floured counter top. It should now be loose, soft and stretchy. Divide the dough in half and form into two balls. One by one, stretch the ball by letting it fall from your hands a few times before placing it on the prepared baking sheet. Only then use your floured fingers to stretch it further to fit. Note: If the dough is getting unmanageable, walk away for 10 minutes. The gluten in the dough will rest and become more pliable again. Add your sauce, cheese and toppings. Bake the pizza for 10-15 minutes, rotating halfway through if cooking both at once. The top should be blistered and the crust golden. 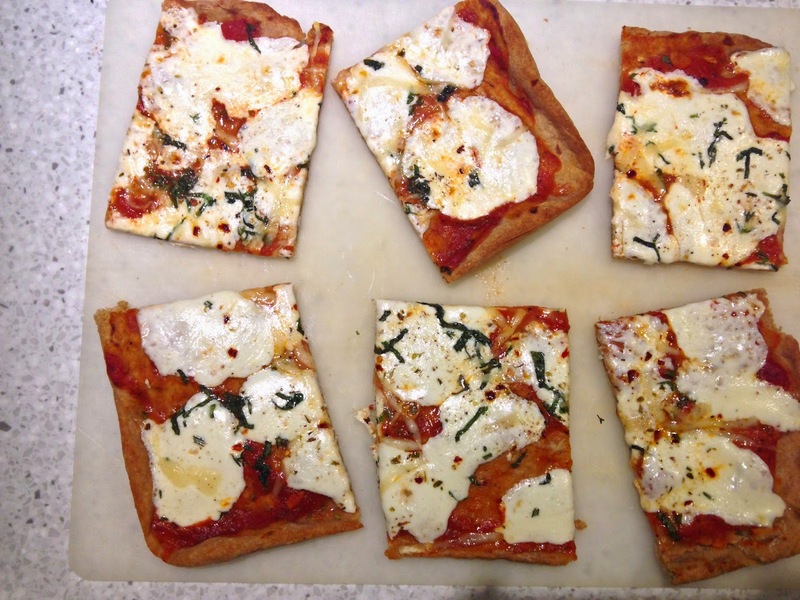 Allow the pizza to rest for about three minutes, then slice and enjoy!